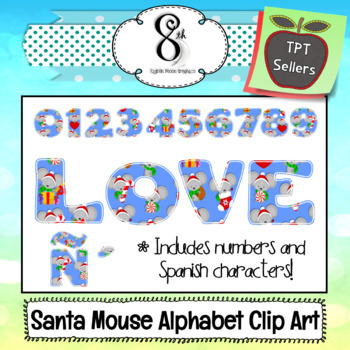 This Santa Mouse Alphabet and Number Clip Art set contains upper case letters, numbers, and punctuation. It also includes a tilde and accent mark for Spanish letters. This set is included in The Ultimate Alphabet Clip Art Growing Bundle. This clip art can be used for bulletin boards, projects, or any other classroom use. Commercial use is permitted for small business, such as TPT, provided that you link back to my store using my credit button.